This documentation is intended for those who want to install Indeni on a physical server. If you cannot meet the prerequisites and/or minimum requirements please install on a virtual machine. Physical access to the server, or through ILO. Hardware: 1x Keyboard, 1x monitor connected to the server. Put the Ubuntu DVD into your DVD drive. A few moments later, a large Language menu will appear. Selecting your language will take you to the boot menu. 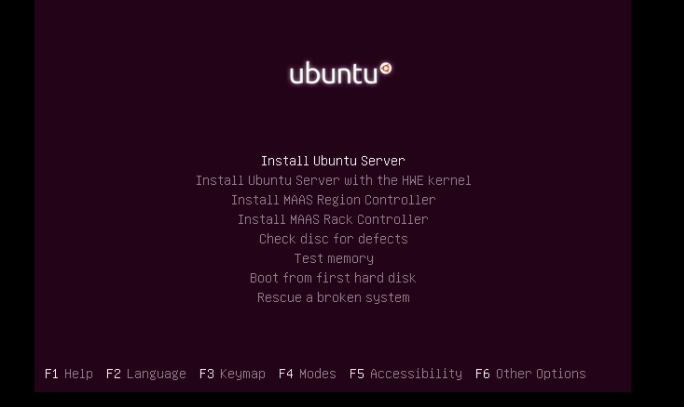 The Ubuntu Server boot menu includes multiple options for testing your system, and for testing the validity of the install media and system disks. Please select the Install Ubuntu Server option to continue. After selecting installation language, geographical location and keyboard layout, the installer will perform some background configuration and processing. In particular, the installer will attempt to automatically configure your network. If the installer successfully detects your network configuration, you will be asked to enter a hostname, which can either be modified or left as the default ubuntu. After networking, you will be asked to enter your full name, username and password. Change the user name to “indeni”. Our default password is “indeni4it”. While you can choose to use your own, Indeni support will not be able to reset should it be forgotten. After answering a question about your time zone, you need to configure local storage. If the storage connected to your server is raw and unformatted, the installer will detect this and present a menu with four options. Select the second option, ‘Guided – use entire disk and set up LVM‘. After accepting the changes that are going to be made to your storage, it will take installer several moments to determine the packages to be auto-installed. You will then be asked to enter an HTTP proxy address. This can be ignored if you don’t know whether you need one to access the internet from your server. You will also be asked whether you require automatic updates. Select Install security updates automatically. The final step before installation requires you to select the software you want pre-installed on your server. You can select from a broad set of categories or manually choose the packages yourself. This option is purely for convenience, as you can easily install any additional software you need after installation has completed. Please select OpenSSH server. Please confirm that the * is next to the selection, otherwise the package wont be installed. Ubuntu Server will now be installed. When complete, one final question will ask for permission to install the GRUB boot loader. Answer Yes. The installer will finish up by installing the final packages and configuration files. 1. SSH into your ubuntu server. Then copy and paste the following into the CLI, “curl -s https://indeni-public.s3.amazonaws.com/packages/tools/indeni-install.sh | sudo sh“. Once that finishes, you will need to complete the Indeni installation. Please follow the Offline Installation Process to if you plan to keep your server offline. If you plan to keep your server online skip, to Configuring Indeni. 3. After the files have transferred, unpack the current.version.number.tar.gz file by typing the following: “tar -xvzf current.version.number.tar.gz“. It should create an additional directory named after the current.version.number. 7. Type ‘imanage’ and then choose #2 to upgrade. Once you are done, you can type ‘isetup’ to get back to the Indeni configuration wizard so you can change the NTP server, set the timezone and apt-get proxy if necessary. For more details on how to setup Indeni, please visit Part 1.2 Installation. Please Note: Do not configure the network details through isetup, but be sure to configure directly in /etc/network/interfaces.